What is IIOT – All About Industrial Internet of Things. Yet another category of the internet is doing rounds these days and is believed to have a much deeper impact on the industrial applications. This “internet” category is IIoT- Industrial Internet of Things or also known as the smart manufacturing technology used for industrial automation and standardizing operations, efforts and strategies across the departments within an enterprise. With a major focus on optimizing the maintenance and operational proficiency, IIOT exposes the doors for intelligent manufacturing and control, smart industrial process, asset management, performance improvement and a more advanced transformation in the industrial domain. With all the major domains concentrating more on customer experience, IIOT is the technology that is address consumer engagement. 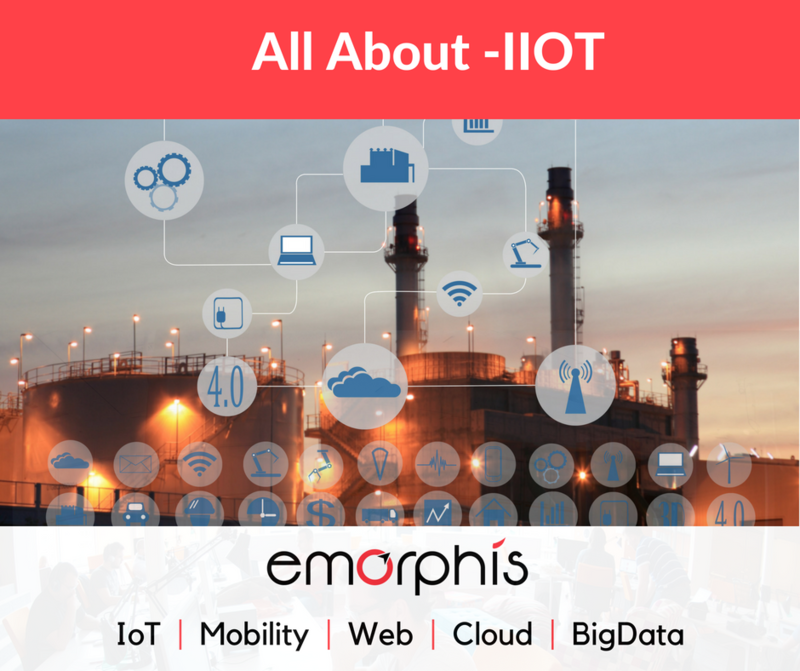 IIOT is a combination of Information and Operational technology blended well with the devices for seamless information sharing and connecting industrial assets with people and business process. Though the idea of connecting devices, people, and process at enterprise is not new, but harnessing the abilities of connected devices for industrial operations is definitely on the rise now. Industrial IoT is very different from the consumer IoT (which includes wearables, smart thermostats, connected cars and other smart consumer products) that concerns more of individual decisions and interests. Industrial IoT involves decision makers that benefit a particular business case. This clearly indicates that IIoT integrates the manufacturing systems and process keeping in mind the demand and supply information and delivering responsive operations & engineering solutions and goals. Data Attainment: when it comes to industries there are multiple machines, systems, sensors, equipment etc. connected and are the major source of data. These are the intelligent devices comprising of processor, software and storage memory that assess the variables such as pressure, temperature, humidity, electric flow and other machine information regarded as data. Networking and communication system: The above data need a communication medium to transfer the information from sensors to devices to the storage. This is an important element as the systems and users of an industrial unit are positioned at multiple locations and thus require a proper secured channel to share information. Edge or Cloud Application: The applications developed for IIoT works on a basic principle of interact, compute and connect towards better decision making. The application also ensures staff evaluation across all the units for projects planning, budgeting and recruiting, automated work assignment and task allocation, automated performance monitoring, automated warning for workplace nuances and employee grievance and reduced asset downtime. Have a look at the available or required assets, data collection, and real-time visibility to measure, predict and sense the issues & prospects. This is how you create a start of IIoT implementation. Use technologies such as big data, machine learning or other automation tools to develop a system that ensures consistent data analysis and communication. Look out for a cloud-based application that could assist your business operations with advanced monitoring, planning, scheduling and integration with mobility solutions. Research and define the IIoT tools that enable smart collaboration between functional teams such as operations, supply chain, procurement, maintenance and other departments. If you are unsure about the automation tools best needed for your requirements, go to a third party IIoT vendor experts that would assess your business need, assets and process and suggest the best automation tools. IIoT technology helps in predictive maintenance– The manufacturing and other similar industries bear a great loss every year due to faulty equipment and system failures. By implementing the IoT automation tools, it becomes easier for the operator to predict the fault in a machine or identify probable defect even before it arises and take predictive measures to ensure safe machinery. As a result of this, manufacturing unit save time, reduced repeat work and lower scrap. The real-time data collected from sensors installed on equipment help manufacturers to track and monitor machine operations and also alert in case of any accidental interruption in manufacturing unit. Implementation of IIoT assist in energy saving– Implementation of smart meters support engineering units to track distribution and consumption of resources, enable lower operating cost and enhanced projections. If a compressor or transformer is left switched on, it can be easily identified by the connected sensors and can be monitored & powered off from any remote location. This way one can easily optimize and lessen energy consumption by the units. Many industries now implement energy management systems to enhance manufacturing operations and lessen costs. Better and improved field service- For industries having a variety of machines or products distributed across the world, it is difficult to manage after sales or troubleshooting operations. To ensure proper after-sales services, companies appoint field executives who collaborate with the backend team to ensure proper technical maintenance. However, the process is tedious. The implementation of IIoT tools helps field executives to identify issues through predictive maintenance and ensure quick fixing using smart glasses and sharing real-time images & videos of the device with the backend team for seamless troubleshooting process. Improved Asset tracking and management- The logistics, packaging, and retail industries are the fastest growing domains to hold a huge volume of assets and make use of real-time asset tracking mechanisms to track inventories, location, supply chain and customer service altogether. Right from manufacturers, wholesalers, distributors/dealers to consumers, track status and transmit the location of the stock. Although IIoT comes with a huge investment but by leveraging data it reaps potential benefits for the industries where it is implemented. With many industries embracing the change and integrating IIoT; have gained real time collaboration between teams and functional groups, a well-defined business process and smart monitoring & operating procedures for better decision making.